Most babies start to show their baby teeth when they are around 6 months of age. As the teeth push through their gums babies can become irritable. They may have unsettled sleep, drool or dribble more, and may go off their food a bit. Teething symptoms happen in stages as each new tooth comes through and continues until your child is around 3 years of age. Most babies seem to get relief from cooling the gums and chewing. You could try a facecloth run under cold water for your baby to chew on or use a specific teething toy that you could put in the fridge (not the freezer). Teething doesn’t make babies sick. If your baby is unwell, check with your Well Child Tamariki Ora nurse or your GP. 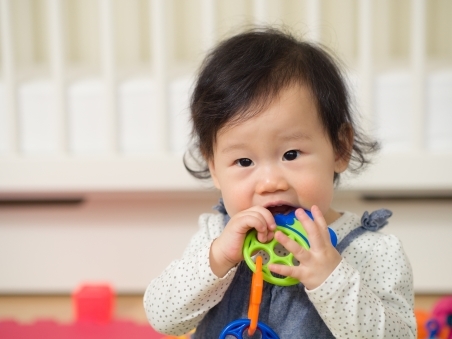 The following link on this page gives more information and advice about what to expect and how to help your baby while they're teething. Information about teething and caring for your child’s teeth.